As Australians, we all love sun here in Australia that we worship our beloved sun and enjoy outdoor activities outside but we need to be aware about how strong of the sun and its associated dangers as same time. 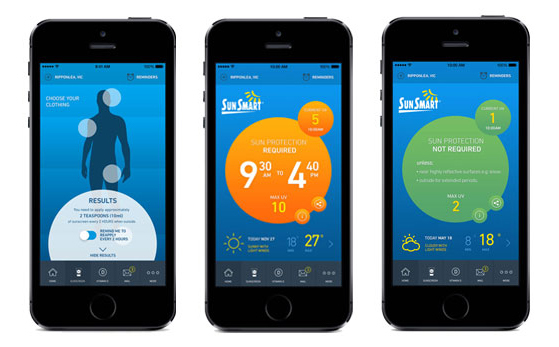 SunSmart App – This app let you know when you do and don’t need sun protection, making it easier than ever to be smart about your sun exposure all year. Australia is located in the South Hemisphere and is close to the ozone hole in Antarctic which it was measured 7.6 million square miles of ozone layer depleted in 2017 according to NASA. The purpose of the ozone layer is to absorb the biologically damaging wavelengths of ultraviolet (UV) radiation in the stratosphere. During summer, the earth’s orbit brings Australia closer to the sun than Europe during its summer that would expose Australians to more UV intensity with 7% to 15% increase depends on atmospheric conditions. The threat of skin cancer is very real here that it is caused by excessive exposure to UV radiation from the sun and can cause DNA damage to skin cells. If this damage is not repaired by the body’s internal DNA repair machinery, then the replication of faulty cell would occur that would result in the abnormal growth of unnatural cells which it could become cancers eventually. According to the Cancer Australia, there are approximately two in three Australians will be diagnosed with skin cancer by the time they are 70. Melanoma is the third most common cancer in Australians. • The incidence of skin cancer is one of the highest in the world, two to three mores the rates in Canada, the US and the UK. How do you prevent skin cancer and sunburn? We just need to have common senses to protect our skin properly from the sun such as put on protective clothes, hat, glasses, and sunscreen and to seek the shade. However, we can look at this nifty and useful app – SunSmart App to enhance our protection by just have a glance at the information. This app is designed to let you know when you need sun protection or not to make easier for you to be smart with your sun exposure all year. This SunSmart app is free to download for Android and Apple users. • Sun protection times> Lets you know when you do and don’t need sun protection for any locality weather forecast> Check the weather for the week ahead and use the SunSmart app to keep covered up when the UV levels are high. • Alert function> Personalise the alert function to remind you of the daily sun protection times. • Sunscreen calculator> Users can personalise with the outfit they’re wearing, as well as their weight and height. The tool uses this information to work out how much skin will still be exposed to ultraviolet (UV) rays and calculates how many teaspoons of sunscreen the user will need to apply for good sun protection. • Download the app and select your location in Australia. • Set up a sun protection alert and receive daily reminders of the times of day sun protection is required. • Select to receive the alert at the time of your choice or at the exact time the UV is forecast to reach a level that can damage your skin and eyes. • Use the sunscreen calculator to find out how much sunscreen you need to apply, taking account of your size and clothing. It would be wise to download the SunSmart App to look after yourself well and to make sure you to make the most of this su­­­­mmer. We hope you would have a wonderful summer and stay safe. Written by the Original PC Doctor on 5/2/19.